This no cook dessert is a favourite of mine. The biscuits used are 'Morning coffee' or 'Marie biscuits'. You can also use the LU Cookies or Rich Tea Biscuits that can be bought from Amazon. I have not seen the Marie or Morning Coffee type in the US except at the PBX on an armed forces base! They have all sorts of European food! This was really popular when we were young as it was one thing we were allowed to make as it did not involve anything electric or hot! I believe the British were the first to make it - came to that assumption because of the British Biscuits used but if anyone knows the origin...please let me know! Two packets of plain biscuits (see above). Beat the butter with the caster sugar until light and creamy. Beat in the melted chocolate and then the eggs, one at a time. Use a largish dish that isn't too shallow make layers of coffee-moistened biscuits alternating with layers of the chocolate cream. 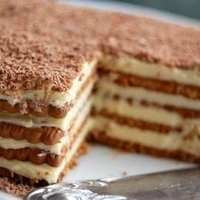 If you really want to be decadent, top with some fresh whipped cream! Grate some chocolate curls on top. these look like they'd be a lot of fun to make. beautiful! This looks like my little would like. Will try to make this one., Thank you for sharing. ladies you eat this with raw eggs ?? I wish I knew the ingredients in American measurments. Like in Teaspoons, Tablespoons, cup amounts? This recipes looks amazing and I can't wait to try it. i dont like coffe. Can i chance with chocolate ? thanks for the recipe.. i dont like coffe. Can i chance with chocolate ? 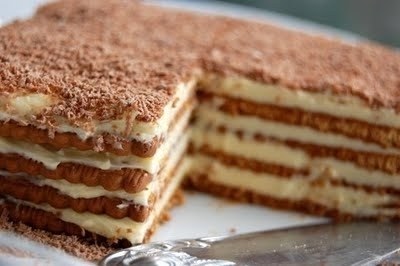 I am making this for tommorow's desert.It sounds awesome and I cant wait.